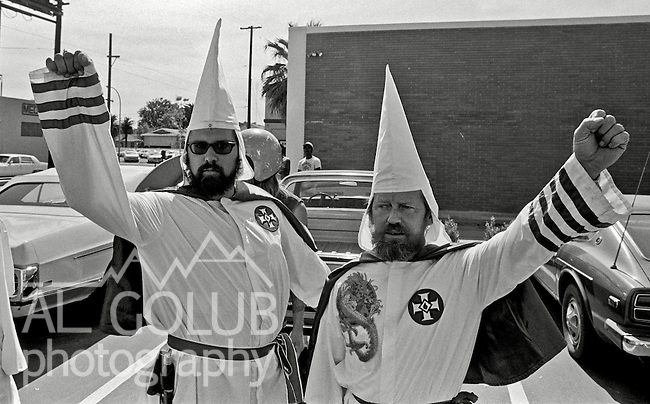 Merced CA--The Ku Klux Klan attempted to hold a big event in Merced Saturday, June 6, 1981. Merced city council had approved a one-hour marching permit. When the Klan showed up--with white robes and hoods--a crowd of several hundred interested Mercedian and members of the International Committee Against Racism (INCAR) appeared and were kept separate from the Klan by the Merced Police. .Michael Leonard and Robert Wyer were planning to lead the march. The Invincible Empire and the Untied Klans of America sponsored the march. Grand Klaliff Michael J. Leonard is from San Pablo. Grand Dragon Robert L. Wyer is from the Fresno-Clovis area. June 06, 1981 Photo by AL GOLUB / Golub Photography.